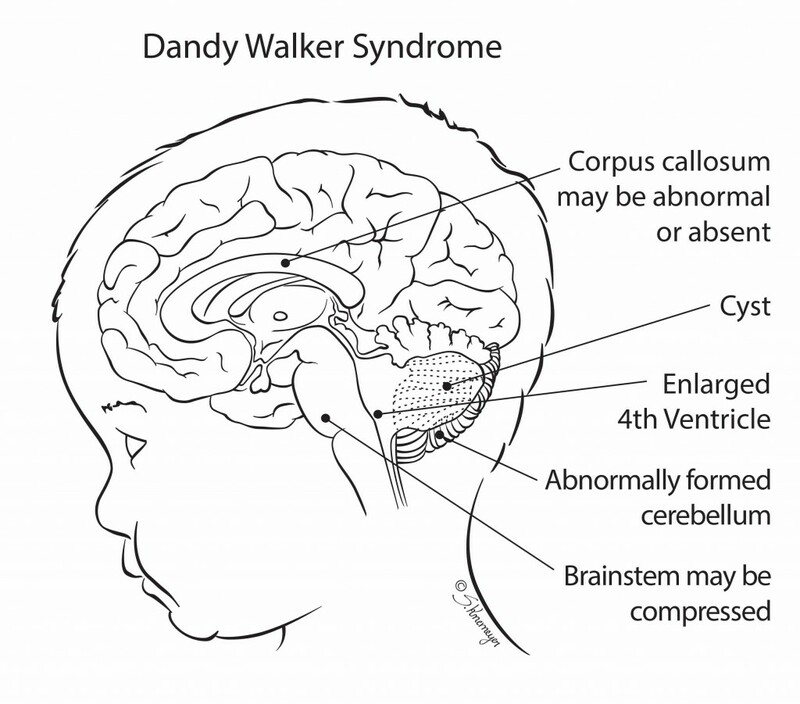 Dandy-Walker Syndrome (DWS) is a congenital (happening before birth) condition where the cerebellum – an area at the back of the brain responsible for controlling movement and balance – doesn’t develop normally. With DWS, also known as Dandy-Walker Malformation, parts of the cerebellum may never develop or may be very small. Other parts of the cerebellum develop cysts (small masses of fluid) or become filled with fluid. In most cases, a build-up of fluid inside the skull causes the head to get bigger than it should. Surgery is often needed to implant a shunt (a hollow tube) to drain the fluid and relieve pressure on the brain. DWS can occur by itself, or may appear along with other types of birth defects. Children with DSW may also have heart problems, face or limb defects, or problems with vison and hearing. In rare cases, DWS may not be diagnosed until late childhood or adulthood. DWS can cause delays in both motor and mental development. But how serious the symptoms are and the long-term outcome of patients with DWS varies widely from child to child. Some children need a lot of medical care at birth, but go on to live normal lives with few or no long-term effects. Other children will have life-long paralysis, seizures and problems with thinking and learning. The long-term survival rate for infants with isolated DWS is very good. If DWS appears with other genetic conditions, outcomes can vary. Early childhood intervention to support physical and mental development offers children with DWS the greatest chance for maximizing their potential and improving their quality of life. No one is sure what causes DWS. Scientists do know that certain genetic conditions or environmental factors may increase the risk of a baby developing the disease. DWS begins during the first month of pregnancy. As the baby’s cerebellum starts to develop abnormally, fluid begins to build up. During the pregnancy, malformations and fluid in the cerebellum continue to grow. The fluid build-up and problems in brain structure cause the variety of neurological and physical symptoms seen at birth and later in childhood. While no one knows what causes DWS, there are likely many factors that could be a part of its development. A number of different genetic syndromes are associated with DWS. Certain medical problems in the mother, such as diabetes, have been associated with the development of DWS. There is some research that says a baby’s risk for developing DWS increases if the mother is exposed to certain types of infections or medicines while she is pregnant. Magnetic resonance imaging (MRI). If your doctor suspects DWS, your doctor may recommend tests like a CT scan or MRI, which can provide your doctor with more detailed images of your baby’s brain and organs. Amniocentesis. A small sample of the amniotic fluid that surrounds your baby may be taken to test for genetic problems that can appear with DWS. Malformation. This is the most severe type of DWS. It is usually seen as part of a group with congenital birth defects. With Dandy Walker Malformation, some parts of the cerebellum are absent, and others are enlarged with fluid-filled cysts. 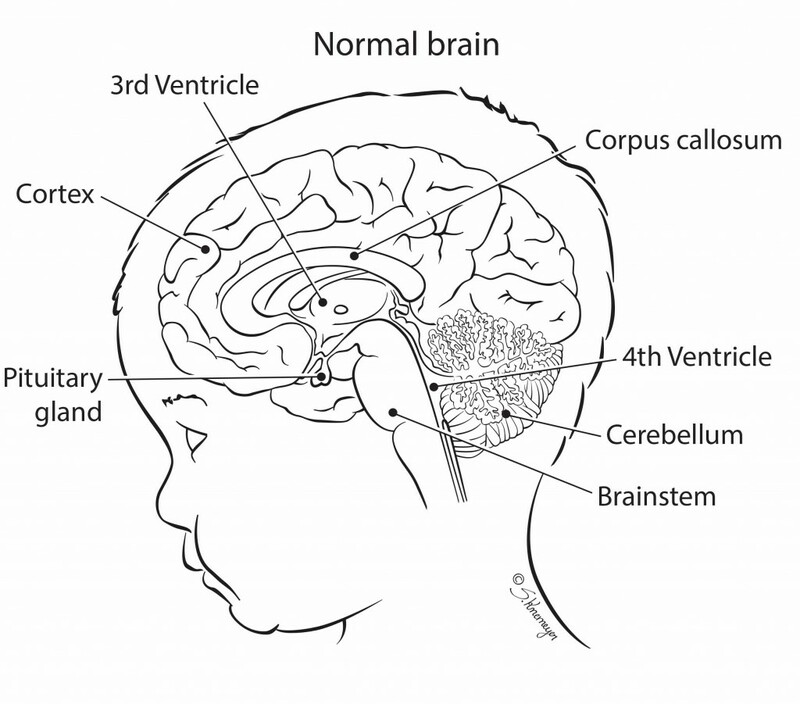 Most babies have hydrocephalus and macrocephaly, and need surgery to place a shunt (a hollow tube) into the brain that will help remove extra fluid. These babies are at great risk for having long-term neurological and developmental problems. Variant. The mildest form of DWS, it has a wide range of symptoms and outcomes. Babies with the Dandy Walker Variant may have less fluid build-up inside their brain, and as a result, less damage to structures within the cerebellum. Babies with this type of DWS are less likely to need surgery to remove extra fluid from their brains, but many still require surgery. Some children with this type of DWS will go on to have normal intellect and physical development. Others will require multiple surgeries to remove fluid inside the skull and require life-long physical therapy. If a test finds you are carrying a baby with DWS, you will continue to receive care from your doctor. You may be referred to the Ohio Fetal Medicine Collaborative (OFMC), which will help you connect with a team of experts at the Fetal Medicine Clinic at Nationwide Children’s Hospital. At Nationwide Children’s you may meet with a multidisciplinary team including neonatologists (doctors who specialize in treating newborns), neurosurgeons (doctors who perform brain surgery), neurologists (doctors who specialize in the brain) and nurses to learn more about your baby’s care after he or she is born. Nurse coordinators will help answer your questions and concerns, guide you through your pregnancy, and prepare you for what to expect. Your doctor will watch your pregnancy closely. If the malformation on your baby’s head is very large, you may need to have a C-section. You will deliver your baby at a hospital that is prepared to care for high-risk babies. You should discuss your plans for labor and delivery with your obstetrician. Contact your doctor right away if you have any concerns. Your baby may receive care in the hospital’s neonatal intensive care unit (NICU) or be taken to the NICU at the main campus of Nationwide Children’s Hospital for further care. An intravenous line (IV) may be started in your baby’s arm, hand, foot, or scalp. The IV provides fluids, medicines, nutrients, and antibiotics to prevent dehydration and infection. Your baby may need to have an ultrasound or MRI to give doctors more detailed information about your baby’s brain or other organs. Blood may be drawn from your baby so that doctors can determine if there is a genetic condition that could impact your baby’s care and treatment. Your baby may be able to breastfeed or feed from a bottle and go home with you. It is very important for your baby to follow up with the doctor in the office for a complete evaluation. If your baby is not able to breastfeed or bottle feed right away, we encourage you to pump and store breast milk for your baby until he or she is ready to start feeding. Treatment of DWS depends on how severe the condition is and if there are other medical problems that doctors must consider. Most children with DWS will need surgery to implant a hollow tube (called a shunt) that drains excess fluid from the brain. This lessens pressure on the brain and skull. It can help prevent additional brain damage and reduce or get rid of some neurological symptoms of DWS. Sometimes shunt surgery can improve symptoms, but sometimes it does not. Surgery to implant a shunt may be done when your baby is a newborn or at a later date, depending on your baby’s symptoms and overall condition. There can be problems with shunts including infection and blockages. If your child needs a shunt, he or she will likely have the shunt for the rest of his or her life. If there are no signs of hydrocephalus, some children may be able to go home a few days after birth. However, parents will need to watch these babies closely for signs of hydrocephalus. Your doctor will explain to you what you need to watch for. After shunt surgery, your baby will receive care in the hospital’s NICU. Your baby will need to be on a breathing machine until he or she is fully recovered from surgery. The total length of time your baby will stay in the hospital will vary, depending on whether he or she is born with other health issues. Your baby will need regular follow-up appointments to measure growth, development, and nutrition. You will want to find a local doctor who cares for children to take care of the routine checkups, immunizations, and doctor’s visits. The program coordinator can help if needed. You will also need to follow up with the pediatric neurologist and the neurosurgeon. If your child has a shunt, you will have regular check-ups with these specialists to make sure the shunt is working. The focus of long-long care in children with DWS is to prevent problems and improve the child’s quality of life. Many children with DWS will always have some level of physical and/or mental disability. Physical and occupational therapy and early intervention are critical to help your child maximize his/her development. Your child will likely always need a shunt to keep fluid from building up in the brain. Shunts need special care to make sure they work .The medical team will teach you what to do to care for your child’s shunt. Your doctor may recommend genetic counseling to discuss risks for a future pregnancy because DWS can be related to inherited disorders.